It's week two of Top Chef: Texas and the third and last group of chefs compete to determine the final 16. Eleven chefs have already earned there Top Chef jackets and four chefs are in the bubble waiting to see who else they'll compete against for a spot in the final 16. 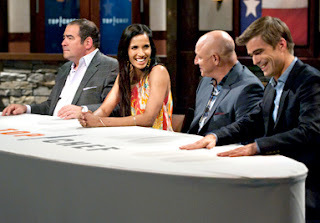 Once again, Padma Lakshmi, Tom Colicchio, Hugh Acheson, and Emeril Lagasse will determine the fate of the contestants. The episode opens with four chefs already in the bubble. Grayson Schmitz comments on how much pressure she is already feeling. Edward Lee comments on how they feel a sense of camaraderie since they all have been through a rough time, but he doesn’t want to befriend the others too much since they are his competitors. Later in the episode he confesses that he would have killed every one of them for a spot. As part of the third group, Lindsay Autry comments on how they don’t know how many spots have already been taken. She’s right, since that does determine how many contestants will move forward. The judges for this group were Tom Colicchio and Hugh Acheson. As usual, the contestants introduced themselves. Beverly Kim made it personal by claiming that she was the one “bringing home the bacon” and therefore needed to win the challenge. The contestants were given ten ingredients, each had to choose one. Underneath a cloche, which was next to the ingredient, was a clock with the amount of time to cook their ingredient. The clocks either had 20, 40, or 60 minutes on them. Tom and Hugh walked the room asking what the contestants were making. Hugh made a couple of comments like an ingredient was “a stumbling block in the past” for other contestants, or “Time’s ticking, getting there.” Hugh was definitely not very encouraging in a situation that was stressful enough without his influence. As the audience, I was sweating for the contestants! Kimberly Calichio was the first one to get kicked out. Andrew Curren was the first one of the episode to be placed in the bubble. Chaz Brown was having an issue cooking the risotto in only 40 minutes. He claimed that his wife, an Italian, requires that the risotto be cooked overnight. Unfortunately, Chaz was so concerned with cooking the risotto properly (and he eventually did), that he did not have enough time to serve the risotto into the bowls. Needless to say, he was disqualified. Laurent Quenioux, a Frenchman that reluctantly came to the U.S., but couldn’t leave Los Angeles, went on the bubble. The veteran chef was given another chance to prove the skills his experience has afforded him. Molly Brandt and Edward were making small talk until he asked her where she’s from. She said she’s from Minnesota. Then he asked where she cooks. When she said she cooks at the Allure of the Seas for Royal Caribbean. He laughed at her occupation as a sea chef, which made her pissed! Talk about making a new enemy! Emeril, Tom, Hugh, and Padma were all judges for the bubble. 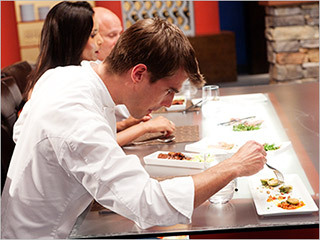 Contestants were given 45 minutes to pick any ingredient in the kitchen to show why they deserved to stay in the show. Edward Lee cut himself really badly and his finger was pumping out blood like crazy. His first instinct was to cover his hand with a glove so as not to get any blood on the cutting board. True chef if you ask me, he deserved to go through just for that. The bubble had two spots for the remaining contestants. Four had to go home. Molly, with overcooked shrimp, was the first. Laurent, with competing flavors in his tartar and cooked scallops that did not go well together, was next. Despite the duck being a little overcooked, Edward was chosen to continue. Grayson was the last one to be accepted onto the next phase.